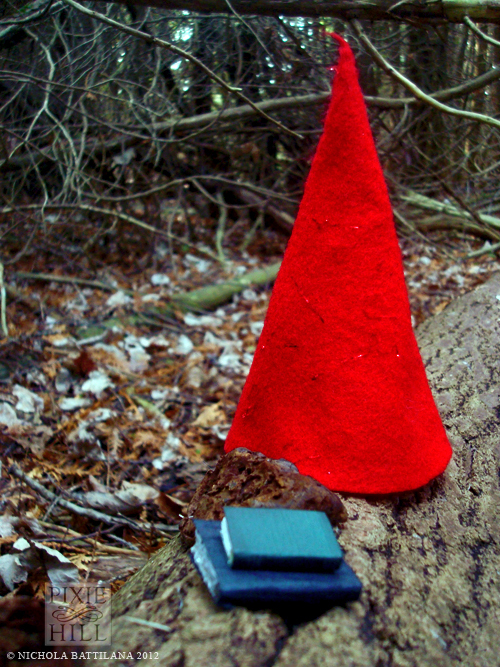 A gnome hat perched on a log with old toadstools, along with a couple of miniature books for good measure. 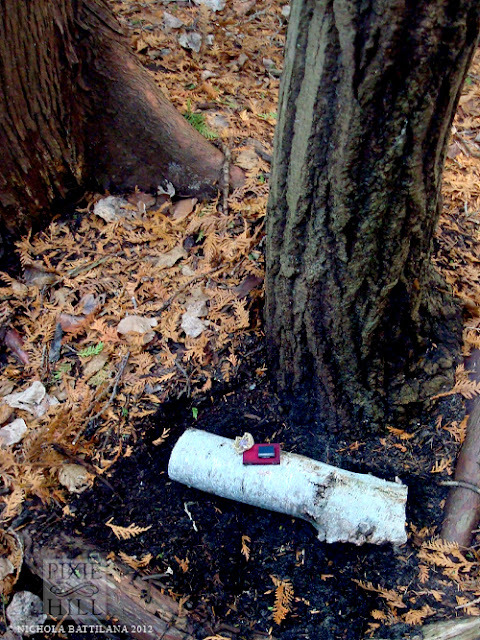 And what is that spied on a piece of birch bark? 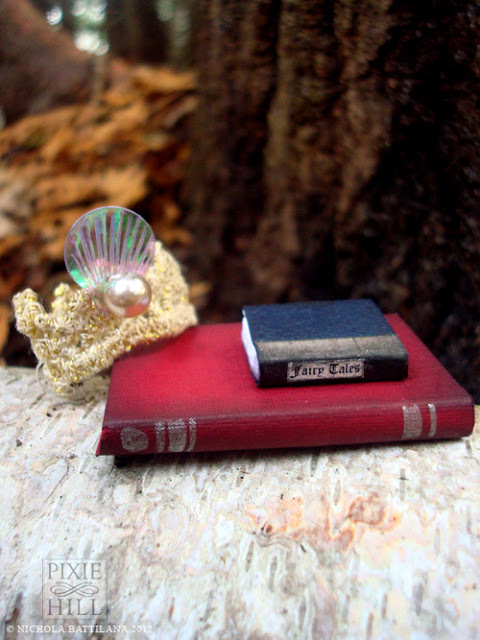 A tiny crown and book of fairy tales! The place is infested with faerie folk. 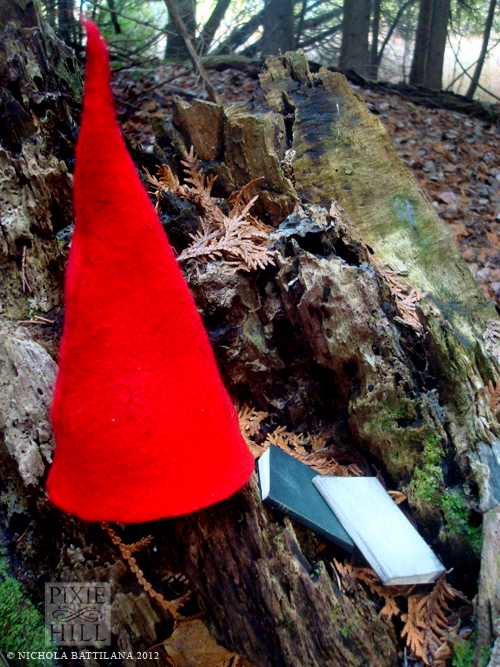 We passed a family walking in the direction of the gnome hats while doing our sneaky business. There was an attempt to follow them and overhear their reaction, but they didn't spy the shocking red of those caps. In the Art Abandonment FB group I belong to, it's common to leave a tag with the work that is left behind. In this case I thought it would spoil the magic for the finder. They are left as if forgotten by wee people with no pomp. If the items are not picked up immediately that's fine, other people will get to enjoy the discovery too. I feel as though leaving those things tagless, without instruction at all, will absolutely ensure those little things find the right home. A finder-keeper who loves those things so much, they're willing to swipe them? Good heavens, Nichola! Are you now crocheting tiny crowns??? Somehow that boggles my mind more than a book of fairy tales smaller than a postage stamp. Actually I totally cheated and used pre-made trim. I'm sneaky like that. How marvelous!!!! I would love to come upon a small surprise such as this! Ans such a wonderful idea - Art Abandonment! So cool! How about 6 five and four year olds! We tiptoed into our little town center park and left all kinds of faerie items and built a little house in the crook of an old cedar trees roots!! Even left little battery candles! Eventually they all disappeared, maybe the faeries took them home!! !